Samsung Electronics reported quarterly operating profits of 8.5 trillion South Korean won ($8.2 billion), a -3.3 percent change from the year ago quarter and its second quarterly drop in a row; the company blamed slowing high-end smartphone and flat screen sales. According to a report by Reuters, the results sent the company's stock up slightly by 0.3 percent, because the company had previously guided for operational profit of just 8.4 trillion won. The entirety of Samsung Electronics, which includes Consumer Electronics (televisions and appliances); IT & Mobile (networking gear; phone, PC and tablets) and Device Solutions (display and chip components) reported net cash after debt of 49 trillion won ($47.5 billion) and cash flow from operations of 12.21 trillion won ($11.8 billion). Apple, which sells products comparable to Samsung's Mobile group, reported net cash of $150.6 billion and $17 billion debt, a difference of $133.6 billion, and cash flow from operations of $13.5 billion. Apple remains a major customer of Samsung's Device Solutions group for a variety of its components of fabrication of its custom Application Processors. Reuters stated that "Samsung's mobile business is poised for an uncertain 2014, analysts say. Its broad range of low-end phones are being caught by the improving quality of Chinese-made offerings, while the large-screen advantage of its top-range phones could be countered by new models from Apple Inc."
Samsung Mobile reported profits of 6.43 trillion won ($6.2 billion), down 1.2 percent from a 6.51 trillion won profit a year earlier. For the same quarter, Apple reported twice as much operating income, $13.6 billion, an increase of 8.24 percent over the year ago quarter. While the company doesn't report sales numbers of products like Apple does, its earnings overview described the mobile market as suffering "lower smartphone/tablet demand under weak seasonality." The company noted that in developed markets, "channel inventory increased due to intensified competition from the previous quarter" while in emerging markets "demand decreased under weak market condition in EM including China." 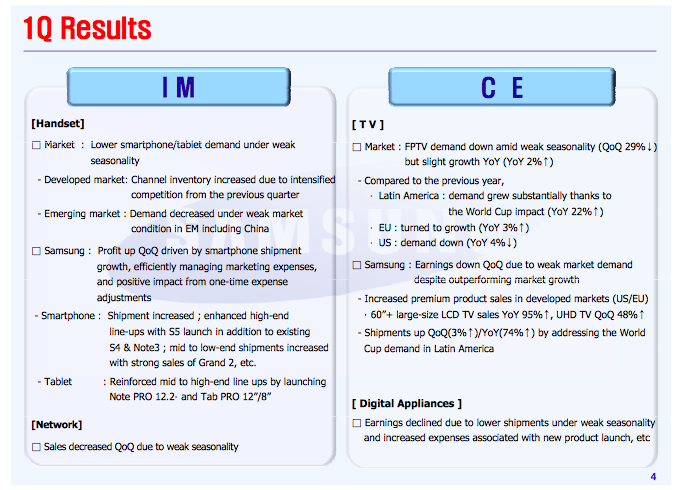 Looking forward, Samsung observed the over the next quarter, it expects "slight growth QoQ as weak seasonality to continue in 2Q" for phones, and for tablets, "slight demand growth under weak seasonality" and it "forecast competition to intensify with line up diversification by set makers amid slowdown of growth trend." Reporting on the same quarter, Apple just announced a very different picture of the global smartphone market. "iPhone was key in driving our stronger-than-expected results," Apple's chief executive Tim Cook told analysts last week. "We sold almost 44 million iPhones, setting a new March quarter record," he noted, stating, "These stronger results were broad-based both from a product point of view with demand for each of our three iPhone stronger than its predecessor and from a geographic standpoint." Responding to a question about China, Cook answered, "we did have an all-time revenue record in Greater China, just under $10 billion at $9.8 billion. iPhone sales were up 28%, that's versus the IDCs market forecast of 20% growth. So we gained share." A significant part of the high end smartphone demand that Apple saw but Samsung didn't appears to be related to the Android to iOS switcher effect Cook mentioned. "I think it's important to point out that if you look at some of the numbers we're seeing on first-time iPhone buyers," Cook noted, "people that bought the iPhone 4S: 85% were first-time iPhone buyers. And the 5c: 69% first-time iPhone buyers. So these are extraordinary, and as you would expect, these are also heavily Android switchers: 62% of the people that bought the 4s switched from Android. 60% of the people that bought the 5c switched from Android. And so we're incredibly pleased with this." On tablets, Cook said, "iPad sales came in at the high end of our expectations, but we realized they were below analyst estimates." He also noted that "over two-third's of people registering an iPad in the last six months, were new to iPad, while over half of the people registering iPhones were new to iPhone."